Mini Portable projector For PC/iPhone/Android. Condition is Seller refurbished. Shipped with USPS Priority Mail Medium Flat Rate Box. Luckies of London (LUKPRO2C) Smartphone Projector 2.0, Portable Phone Projector. New in box. Easy to use, just dock your iPhone 4 device and project videos or iPhone Photo Slide Shows onto any surface. Perfect for travel, meetings or keeping kids entertained on the go. Super-bright 15-lumen projector lamp. Projects up to a 50" image. Built-in 0.5W speaker and focus adjustment. Rechargeable, powers the iPhone 4 device, too and battery charges via USB connection with the included cord. When fully charged, the projector may also be used as a back-up battery for your iPhone 4 device. Condition is New. 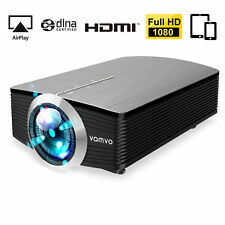 Crenova XPE496 1080P HD Video Projector. If you are looking for the biggest and brightest HD content from all of your devices, in a compact and versatile design, look no further than this stylish and user-friendly video projector. Exquizon LED GP12 Portable Projector 800 480P Support 1080P HDMI USB SD AV Connect. 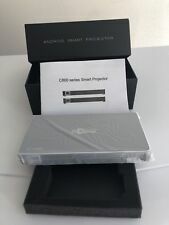 3D 1080P HDMI Over RJ45 Cat 6 Cat5e Network Ethernet Converter Splitter Extender. Smart Projector with Excellent Projection Performance. BRAND NEW Projector 30"-150" Home Theater Classroom Movies HDMI iPhone Galaxy. Condition is New. Shipped with USPS Priority Mail. Condition is New. Now with wireless connectivity for compatible iOS and Android devices. iOS devices require iOS 7 or later and the Miroir Wireless App. Wireless viewing is limited with iOS to certain files types such as native video, photos. BenQ Joybee GP2 DLP Projector. BenQ Joybee GP2 DLP Projector Specifications. DLP™ Display Technology. Projection Lens. 1 x iPod Docking Station. 1 x Mini USB Type B. 1 x Stereo Mini Jack. In The Box. 【New Android 7.1 Mini Projector】Toumei C800S mini projector is made by the most cutting-edge technology: DLP projector tech, Android Operation System, Keystone Correction, Bluetooth 4.0, Quad-Core CPU, HDMI/TF/USB Socket for external media playing. With CE & RoHS certificate..
HDMI SD USB VGA Interface Multiscreen InteractionVia iPhone Data Cable. 3D TV Glasses&Accessories. Jewellery & Watches & Glasses. 1x HDMI,1 x USB, 1x VGA,1x Audio Out, 1x AV. Various interface such asHDMI, USB, VGA for your choice. Made for IPhone 4, 4S, IPhone 3GS and IPod Touch (3rd/4th) Gen. We will do our best to make it right. Form Factor. Contrast Ratio 120:1. Support iOS Cast and Miracast, wirelessly connect your iPhone/Android phone, iPad/Tablet, direct faster connection for streaming HD videos, audio, images, office files from your smartphones, no need to use cables and buy HDMI adapters, wireless dongles. Excellent condition. Brookstone Pocket Projector iPhone 4 Device Video to Go up to 50" images. Condition is Used. Shipped with USPS Priority Mail. Please note that the box is not included, I have pictures of it on there for reference only. 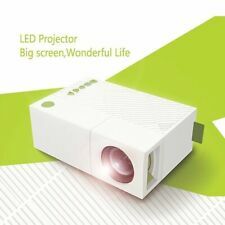 Mini Portable Projector 2400 Lumens Projector 1080P Suit for PC/Mac/TV/DVD/iPhon. Condition is New. Shipped with USPS Parcel Select Ground. Video Inputs : HDMI. Modified Item : Yes. Features : Built-In Speakers. 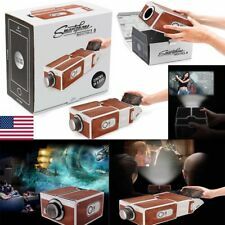 DIY Novelty Smartphone Projector by Luckies of London - NEW & UNUSED. Conceived in-house for Luckies of London, England by Xavier Unwin. This is a novelty DIY cardboard projector. Keep lens out of sunlight. NEW OPEN BOX!! Crenova XPE496 2018 Upgraded Projector For PC/Mac/TV/DVD/iPhone/iPad/Video Games. Shipped with USPS Priority Mail.